Its so seventies, yet its so darn new millenium! Two different eras, fused together by a common passion of motorcycles. Just that feel, isn’t it great? That swashbuckling 70s era which we dream of, heard from our parents and elders, those swinging 60s and then the present… all gizmotic (? ), tech hi-fi, the world at your palm. And then… a beautiful bike just gives us exactly what we refer to as ‘best of both worlds’. 70s styling with new age high tech. New-Age Retro! is it? I have ridden the ZRX 1200 and frankly it’s a bit scary. 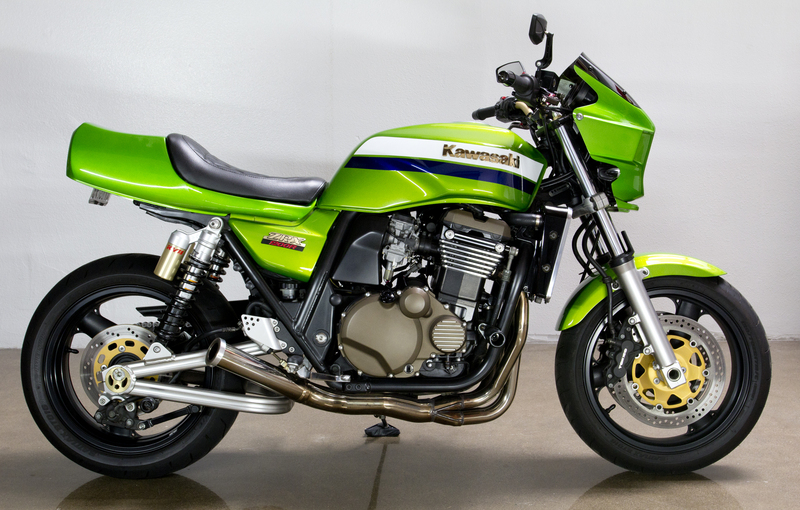 The ZRX1200 is Kawasaki’s tribute to the 70s. You might be aware that the donor of the bike is none other than the mighty Kawasaki NINJA ZX-11 powerplant. Except for the engine, which is also a part 70s, the bike retains most of the components of that era albeit with upgrades. For example, the frame is a standard tubular cradle configuration with upgrades like a massively reinforced swingarm. 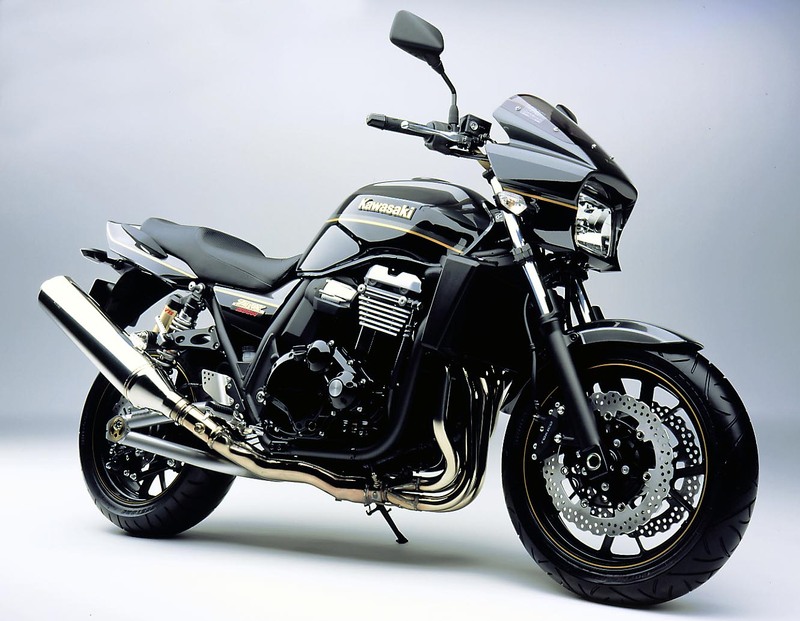 Sitting posture is very street like, that is you sit ‘on’ the bike, very good seats, quite comfortable. So then you start the engine, the howl is very very 70s and as you pull the throttle, the 70s era suddenly vanishes and here you go… it suddenly accelerate as if its tail is on fire. Then you realise that this actually IS a new millenium bike and behaves like it, its just that it LOOKS like a 70s bike. What awesome torque! And no, its not fuel-injected, so I still believe those four Keihin 36mm CV carburettors at times fare better than FI and unlike a FI system, you can fiddle with the carbs too! Isn’t that great? Anyway, once you realise the impact from the initial thrust, you would tend to believe, okay now I am in control. Wrong again! Anytime you pull that throttle, mid range, low range, top range, there is so much of torque that you would be (not pleasently, but none the less) surprised and that keeps on going till you hit the redline at 10500rpm. The other non-70s part which is quite striking is the handling. 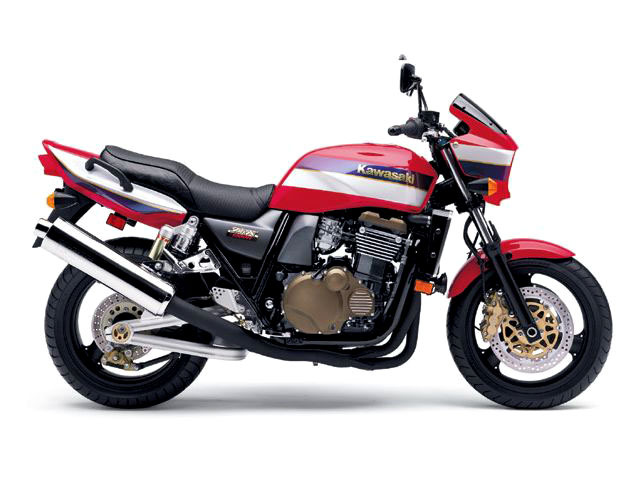 The Z series from Kawasaki back in the 70s were the fastest bikes, but the Honda CBs and the Yamaha XJs beat it in terms of sales as the Z series were not the best of handlers and especially in corners. This ZRX 1200 has no such problem. Although the look remains, Kawasaki has very cleverly added new parts like the mentioned swingarm and adjustable shocks in the rear. The ridged-aluminum alloy swingarm features an underside-braced design, and is shaped for increased rigidity. Also the handlebars are just wide enough to put that confidence in you and overall the brakes are quite good. 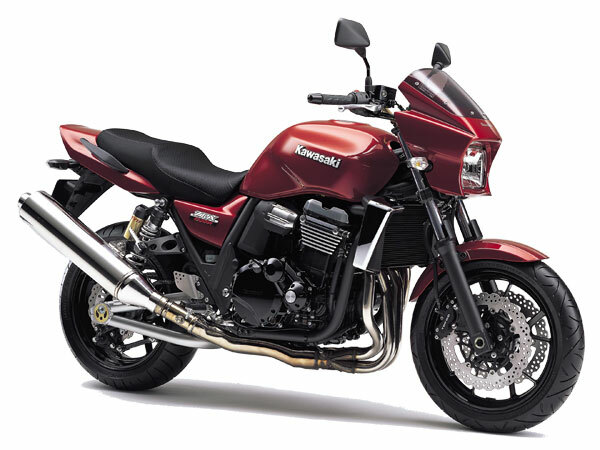 As a total package, this ZRX1200 is quite a handler. Its blazingly fast with 127 horses, will do wheelies anywhere, but there is one part though which might tend you to lay off this rocket. After some time on the bike, once you access the powerband and its handling, the evil twin of yours will rise and tell you to twitch that throttle just one more time just for the thrill. That is the part you have to be contend with. Now, you dont compare a Sports bike to it, yes the Ninja ZX 6R Ninja has equal number of horses in it with half its size of the engine, but then after 2 hours on the Ninja, your arms and shoulders will be begging for some rest and the ZRX is not meant for racing. Its a street bike with loads of fun and any biker with any favoirates, say a cruiser vs an off roader who would probably kill each other, would very much like the ZRX. Such is its character, its a definite allrounder. 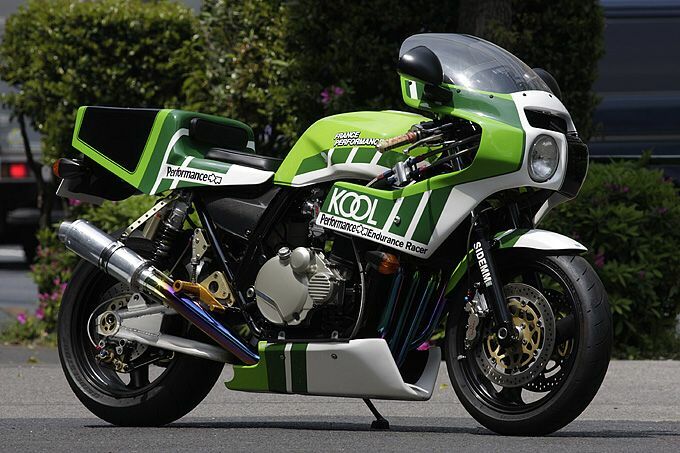 No matter what, a Kawasaki always looks great in green, dont you agree? The ZXR also started with its distinctive paint schemes but later to suit customer demands, more options were introduced. To add to the looks, a mention must be made of that awesome looking four-into-one exhaust which is made entirely of stainless steel with a polished muffler. This torque happy machine has a muti faceted personality. It acts as a street bike, but with so much power, you can always mistake it as a sports bike. Its a very user friendly bike and its real strength shows when you will take it to the highways. To make the engine even more rev happy, the carburetors feature the Kawasaki Throttle Responsive Ignition Control (K-TRIC) throttle position sensor. Connected to the digital ignition system, K-TRIC varies ignition timing according to throttle position and engine rpm so that the ignition compensates for differing engine loads. The result is crisp throttle response and better fuel efficiency. The ZRX1200 is still available. Yes, it has stopped as a production bike almost all over the world, yes almost, because in Japan, its upgraded brother has just been released. 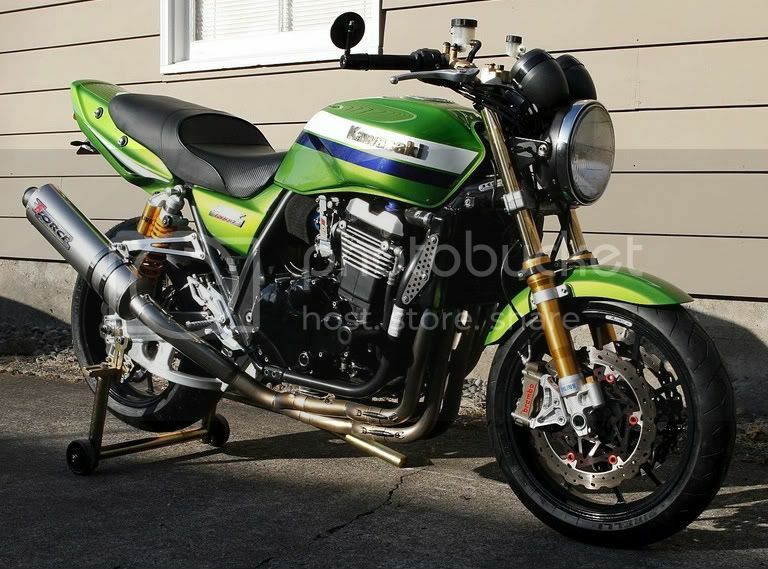 Its the Kawasaki ZRX1200 DEAG and its Fuel Injected too! They have also given the bike its own website. The ZRX is/was available in two models, the S & R model, the S model comes with a full fairing while the R is a bikini fairing, The “S” version is a bit too sleek and modern for the 70s look, but if you dont want your chest beating the wind at 200kmph, you better choose that. Anyway you look at it, this is a mighty good looking bike.